During the 19th century, the population of London grew and put pressure on the ancient sewage system and water supply. 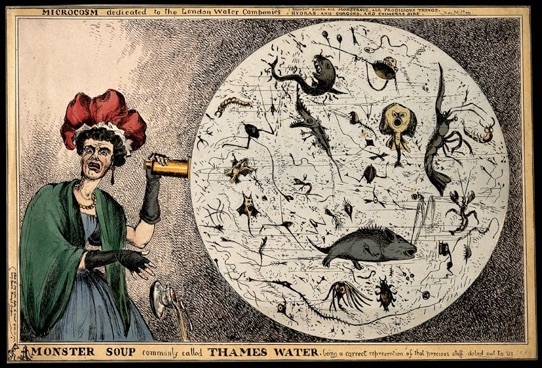 The Thames had become polluted with the city’s refuse. People and industry had been pouring it’s sewage, chemicals, dead animals into the river and gradually it became congested with pollution. People hoped the river would wash the refuse out to sea, but being tidal it just moved back and forth with the river flow. There was a demand for clean water. The Chelsea Water Company, experimented with a water filter bed at Pimlico in 1829. James Simpson was the engineer. But the Thames was so polluted that he believed the only way to get clean water was to filter it before it had become polluted. That is, to extract it up-stream and away from the centre of London.